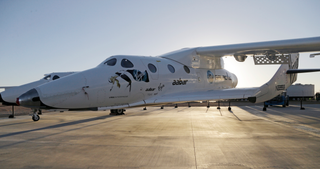 Following the tragic accident on Friday which saw Virgin Galactic's SpaceShipTwo fail catastrophically, engineers are now scrabbling to understand the cause. In a new briefing, the National Transportation Safety Board has explained that the craft deployed its braking system prematurely. "What I'm about to say is a statement of fact and not a statement of cause. We are a long way from finding cause. We still have months and months of investigation to do, and there's a lot that we don't know. We have extensive data sources to go through." "Normal launch procedures are that after the release, the ignition of the rocket and acceleration, that the feathering devices are not to be moved — the lock/unlock lever is not to be moved into the unlock position — until the acceleration up to Mach 1.4. Instead, as indicated, that occurred (at) approximately Mach 1.0." "This was what we would call an uncommanded feather, which means the feather occurred without the feather lever being moved into the feather position. After it was unlocked, the feathers moved into the deployed position, and two seconds later we saw disintegration." While initial speculation suggested the rocker motor—which was using a new kind of fuel—may have been at fault, Hart explained that it was operating normally until the tail feathers extended. Debris retrieved from the ground also reveals that SpaceShipTwo's rocket motor and propellant tanks were found in tact—with no signs of burn-through or breaching.